For our ministry we had to travel across the country in the beginning of 2006. On two trips we actually loosely followed the path of Route 66. First from Tulsa to California, then from Chicago to Tulsa. Since we had to go those directions anyway, we decided to have fun with it. 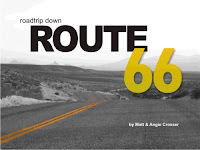 We got travel books about Route 66 and stopped and took pictures of many notable sites along the way. We saw leaning towers, ghost towns, the largest cross this side of the Mississippi and many other things. I am currently working on a photo book that compiles many of our best pictures. I will also toss in some original artwork based on some of the sites we saw. Hopefully, it will be done at the end of this month. 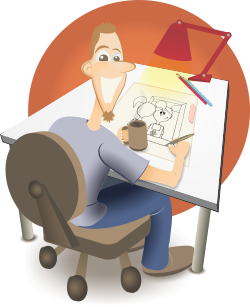 Ok, I finished the book titled, "The Complete Animation Course." It was good, but towards the end it was focusing on Computer 3D animation which I am not into doing. I like it, I just haven't been interested in that medium. So, now I am reading another book called "Animating Culture". It is all about the sociological impact of cartoons on society and of society on cartoons. I just started it, but it looks good so far.